If you’re like me then you probably have a server at home running various like VMWare, Hyper-V, plex, a web site, owncloud, etc. And if you’re already running all of that stuff then it’s not that hard to spin up another virtual machine to run some type of monitoring solution. Whether that is PRTG free, Nagios, or one of the many other projects out there. I’m glad to say there is a simpler option, Domotz! Provide a computer on-site as a part of the service to sit there and collect the data. Most MSPs opt for option 2 because it’s an awkward situation to say they tell a client they have to buy a computer/server that they to support the service providers platform. Option 2 allows the MSP to bundle the machine in as a part of the service which is flexible, but then there is the on-going costs. Most of the time MSPs are Microsoft partners so instead of footing the licensing costs for Windows Server or Windows 10 Enterprise upfront. They will use Microsoft Service Provider Licensing (SPLA) to monetize the cost out across the length of the contract with client. With SPLA licensing there are costs and reporting procedures that go along with it as well. So I when I went down the path of reviewing all of these new monitoring solutions a side goal I had was to see if I could find a solution that the onsite agent could run on a NAS or something Linux based. That is when I found Domotz! Remote monitoring through mobile apps. 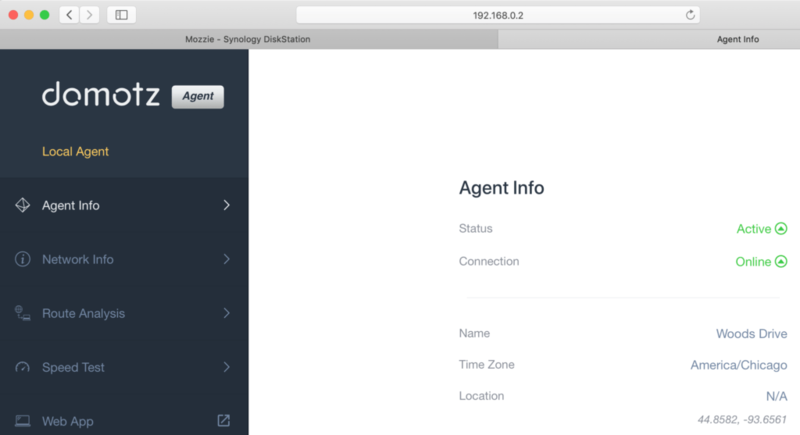 Agent runs on a Synology NAS. The full list of features and pricing is available here for you to look at. Even though they are starting to expand into the MSP market, they aren’t fully business ready yet. When you read through the forums the supported devices are geared towards the premium home gear. For example the forums were excited when there they added support for the small business series of Netgear switches. Which a cheap Netgear switch is fine for a home but in a business environment I throw these things in the recycling as soon as possible. So let’s go through all of the good stuff. In today’s modern environment I love that their portal supports 2 factor authentication. When you look at this solution as “you’re and installing an agent in you’re house and dumping the data and access to a 3rdparties cloud” Then I want the extra security to verify access to my account. There are many monitoring companies that don’t have 2FA built into their products and their products are exponentially more expensive. When you log into the portal you first come to screen that has a map and list of all the agents that is under your account. Each physical site only requires 1 agent. So If you have a house and a cabin and they both have things you want to monitor then you can deploy agents at both sites and see them in one portal at a glance. Granted this view was mainly intended for the home integrators and small MSPs to see all of their clients in a single view but either way it works for the home user as well. If you have a switch that supports SNMP monitoring Domotz with go and figure out which devices are plugged into those switch ports. Unfortunately there isn’t a visio like map you can make. If you want to make a pretty network for a client all the information is on one page. Also if it is a PoE switch and you have wireless access points or PoE phones attached it then you can control the PoE settings from the same view. This allows you to do basic troubleshooting remotely. For every device you can create zones and/or rooms and start logically grouping devices. This is helpful for larger deployments or if there is multiple switches in use. Lets say you have a very large house with multiple switches (or a normal house with 2 small switches) and you get an alert saying that a bunch of devices are offline. If you organize the devices into rooms then you can start coorlating those alerts. For example of all the offline devices are connected to the same switch and nothing else is down, then immediately you’ll know it’s a switch issue not an entire site down situation. Then you can use the remote management features and start troubleshooting. In today’s world we all have bought something that is “smart home” whether it’s a smart plug for a lamp or a full Sonos or hue set up. In my house I have a couple Wemo and TP Link smart plugs throughout the house and I can control them from Domotz. Granted I could always switch to homekit, alexa, or the vendors app to do control them but having the controls in Domotz makes life a little easier. Remote Management is huge. Being able to tap into web based management and command lines from the same portal saves a ton of time. Otherwise the other options are either using a VPN, Teamviewer, or going on-site. So Being able to pop in through web browser saves me a ton of time. The Agent. Domotz has their own hardware that the agent can run on. Also it runs on Synology NAS, Qnap NAS, raspberry pi, windows, and linux. Lately I’ve been condensing a lot of my homelab because I don’t have the time to maintain it anymore. So now at the end of the day if my Synology NAS is down, my house is down. I love that I can install the agent on the Synology NAS and not have to have an extra device or virtual machine to maintain to monitoring my network. If my NAS is offline I get a notification on phone that there is a problem. Lastly its affordable. There is 2 pricing models either $3 or $6 a month per site. Here is the differences between them but for most people they would fall under the $3 a month category. They are interducing a higher tier but that is geared for small MSPs for $19 a month. So that’s in a nutshell. I highly recommend that you check out Domotz if you’re looking for a simplified network monitoring.